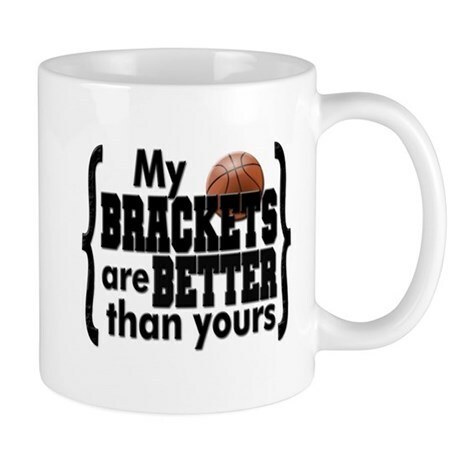 Your March Madness officially begins tonight. Selection Sunday means filling out your brackets during office hours on Monday. A week from today most of them will be wonton soup. However for me, my March Madness ended last Thursday night. All I had left was March mud. A frenzy of watching four conference tournament games in less than 26 hours in two different Vegas venues gave me all the college basketball I care to digest. I’m finished. Y’all enjoy the tournament, you hear? And if watching mediocre college basketball is as painful as having teeth pulled, then I’m in the right place. I had both impact me within those same 26 hours. Ibis left on Wednesday morning to have two worn-down teeth yanked- a molar and his canine. It was an all-day process. In between I figured I had enough time to run out and catch the PAC-12 opening round game between UCLA and Stanford at T-Mobile Arena. The game had personal meaning to me but Ibis didn’t really care. All that mattered to him was I wasn’t there when he got home. Both coaches – UCLA’s Murry Bartow and Stanford’s Jerod Haase are former Birmingham guys, with their first head coaching jobs at UAB, and still friends of mine. Ibis didn’t care about that either. In our 19 years living in Alabama, UAB basketball is a program I had, and still have, an emotional attachment with. These days Haase and Bartow are at two different places in their careers. Jerod, 44, is a former Kansas point guard with his stock on the upswing at a big time program. Murry, 57, in addition to six seasons at UAB was head coach at East Tennessee State for 12 and since has held two interim gigs- at South Florida and this one at UCLA which was schedule to expire with his next loss. He will scramble for a new job over the next few months. It was a great opportunity for me to see two gentlemen, who I spent a lot of one-on-one time with, go against each other. I’ve know Bartow for 20 years; Haase for eight. It was actually their third match-up of the season having split the two regular season contests. And if pressed I probably wanted to see Bartow, whose dad Gene also coached at UCLA and started the UAB program, win as a UCLA run in the conference tournament potentially had more of an impact on him finding another head job while Haase is secure in Palo Alto. Bartow was promoted to interim Bruins coach in January when his buddy Steve Alford was fired on the eve of conference play opening. UCLA already told Bartow this was a short term assignment and be ready to pack up and leave when the season ended. Our second household oral extraction was scheduled for the morning after the game, Thursday, as Andi also had to have a pesky molar removed. My out-of-pocket cost of both procedures outweighed the GDP of Malawi. So, living in a town where making a bet or buying a joint is easier than buying a couple of apples at Albertson’s, I figured the best way to get some of that GDP back was to find a wagering window. I am real good at betting basketball. Gymnastics too. Spanking new T-Mobile Arena, owned by MGM and built behind New York-New York and what used to be the Monte Carlo but lipstick has rebranded it as the Park MGM, had about a quarter of its 17,000 seats filled for the Stanford-UCLA tip. On hand were the diehards wearing red and blue and a few early birds for the Oregon-Washington State game that followed. The rest of the arena was occupied by those looking to find safe harbor from the 40 mph winds blowing outside that had the Bellagio swaying. My betting acumen was rewarded by taking UCLA as a two point dog. Understand, this isn’t the UCLA our dads and us kids knew. About the only thing in common with the John Wooden glory era were the four letters across the uniform chest and Bill Walton doing the TV color. Walton arrived in Vegas from his home on Mars and had a great time during timeouts throwing tee shirts into the crowd. His smile and persona looked like the confirmed stoner just visited one of our dispensaries, which he probably did. In fact, that might have been the only way to watch the first half. UCLA scored first and never trailed. Both schools had made headlines earlier in the day, not for their hoops talent, but for being a part of Operation Varsity Blues, the college admissions scam. And why do I feel slighted because my alma mater, The U, wasn’t one of the schools parents had to cheat to get their kids admittted? UCLA was up 14 at the half but should have been up by 50. Both schools looked they had talent on the floor that were part of the Varsity Blues program. Stanford shot 23%. I took four shots in my high school basketball career, made one and shot 25%. If it wasn’t for a 14 on the ACT, I coulda been a Stanford hoops stud. The second half looked like a Knicks intrasquad scrimmage. Someone had to win. UCLA opened the lead to 24 and then lost interest. Stanford, smart kids that they are, finally figured the challenge was to put the ball in the hoop, not just hit the rim, and whittled the lead down to five before ultimately falling 79-72 in a game that was never that close. Bartow kept his office for at least another day. I cashed my ticket that covered about a quarter of Ibis’ molar. Cha-Ching. This stuff is easy. Early Thursday morning, when they took Andi to surgery to return with one less tooth, I asked how long the procedure would take? Sixty minutes was the answer. I told the nurse I would take the ‘over’. She didn’t seem amused. Sixty-seven minutes later they wheeled her out looking like she just took an unauthorized cell phone photo of Conor McGregor. Cash the over. When you’re hot, you’re hot! Earlier in the week, before we knew anything about a bum tooth, I had planned to go to a basketball triple header the same day as Andi’s extraction. The first two games at UNLV’s Thomas and Mack Center of the Mountain West tournament and the evening over at the PAC-12, knowing either UCLA or Stanford would still be alive. So on the way home from the dentist, still under general anesthesia, I thought would be a perfect time to ask my wife if she minded if I went to the games. She’d be asleep anyway and wouldn’t remember. Not being able to open her mouth she mumbled what sounded like “Ireallydon’tgiveadamnwhatyoudo.” Thank you sweetheart. Can I get you anything? “Gobuysomejello.” Heck, I can handle that. She slept. Ibis, still groggy, slept. Deuce, our two-year old, also slept because all he ever does is sleep. And bark. As it turns out I wish I stayed home and slept with them but twenty-five minutes later I was at UNLV’s Thomas and Mack for a Mountain West double-dip. First up was the University of Nevada, from that upstate cowtown called Reno, ranked 14th in the country against Boise State who I never knew played basketball. We know they play football on a blue field but I never heard of them playing hoops. Nevada was 11 point favorites. It was more easy money. That was until Nevada got into a 13 point first half hole against the football school from Idaho. Nevada rallied, winning by eight. Not enough for me. That was the bad news. The good news was my seat was directly behind the Nevada pep band and they stood the whole game. All I could see was tubas. At least I couldn’t see my money disappear. BTW- if you are filling out a bracket or a pool, I don’t think Nevada makes it to the second weekend. Losing wasn’t bad enough. Andi called right as the game ended. “Whothehellbuysjelloinabox?” I think that’s what she loudly slurred. “Whydidn’tyougetthereadytoeatcups?” Who knew there was such a thing? 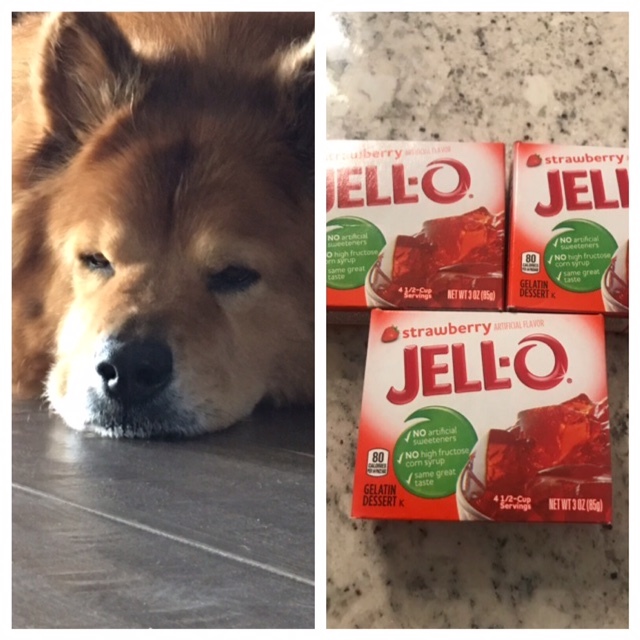 What do I know from Jello? I bought the boxes of Jello my mother always did. How was I supposed to know it takes about four hours to make? Don’t be asking me to step out of my zone. After all I am a basketball handicapping, not gelatin, expert. Recovering Ibis could care less about UCLA and Stanford; who knew Jello came in anything but a box? With Andi back to sleep, I could get ready for UNLV, Nevada-Las Vegas, the tournament hosts against San Diego State, a two-point favorite. Don’t mistake this UNLV team for the Runnin’ Rebels of the late 80s and early 90s. Back then UNLV basketball owned Vegas. Those days getting a seat at the 18,000 seat Thomas and Mack Center was the toughest ticket in town. Tougher than Frank at Caesars or Sammy at the Dunes or Dean at the Sands back in their day. Everybody wanted to be seen at a UNLV game. These days it’s a place to go if you don’t want anyone to notice. Attendance, on a good night, is about a third of capacity. The 1989-90 National Championship banner that hangs in the rafters is dusty; the only connection to Tark the Shark is the court being named in Jerry Tarkanian’s honor and the last attachment to Larry Johnson, Stacey Augmon, David Butler, Greg Anthony and Anderson Hunt is on the back of some guy’s jacket in the stands. And yes, if you look hard enough you probably can find the renowned hot tub in a storage closet in the arena basement. 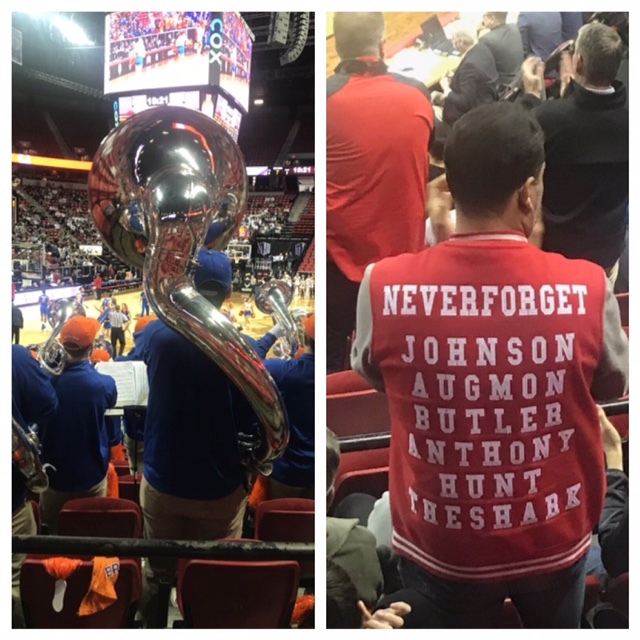 A tuba view of the Nevada-Boise St. game; A UNLV fan who remembers the good-ole-days. All said, UNLV has now become my adopted team. My son Scott is an alum and upon our arrival in Las Vegas six months ago, the athletic department officials greeted me with open arms with the hopes of an open checkbook. So even though I liked San Diego State minus a bucket, my heart told me to go with the Rebels. My wallet didn’t like the decision as SDSU ground out an ugly 63-55 win despite shooting 29% for the game, just a notch better than my high school eye. UNLV fired their coach the next day. The two game losing streak didn’t bother me because there was still one game left to wager and being that I know basketball, I knew I’d get it all back and then have some gas money. I drove the three miles from UNLV over to T Mobile hoping to avoid the hat trick of shame in a building the hockey Vegas Golden Knights call home and where a hat trick is a good thing. For me it wouldn’t be. My day’s finale was UCLA and Arizona State. Bartow left me a ticket right behind the Bruins bench. After all, I am undefeated, 1-0, watching UCLA basketball up close and personal. Arizona State was a 4.5 point favorite in the game but being basketball savvy I knew UCLA started quick. I bet UCLA in the first half plus 2.5 points. It was all going my way until Arizona State closed the half on a 14-0 run to take a 45-29 lead into the locker room. By this point I wanted to feel like Bill Walton did. Arizona State won the game 83-72 as Bartow had the lights turned off on his UCLA days. It was too much basketball in twenty-six hours. I was tapped out. I also tapped out. My scheme for recovering dental bill monies left a gaping cavity in my wallet. Enjoy the next three weeks. My March Madness officially turned into March Mud. I’m done. When does baseball season open?